"The Stockport & District Badminton League (SDBL) is an organisation set up to provide and promote competitive badminton on the League principle for clubs in the neighbourhood of Stockport, (Cheshire, England), and to arrange matches, tournaments and all other events connected therewith"
My Wife for reading the final draft and suggesting alterations, as necessary and some typing, and my son for the majority of the typing and the use of his PC. Their help is greatly appreciated. My apologies if I have forgotten anybody. I am, indeed, honoured to be asked to write the foreword to this commemorative booklet celebrating fifty years of Badminton in Stockport and District. My involvement in our League spans a mere twenty four years, but this booklet is testimony to much longer serving members who have played a significant part in the development of the League in many different capacities. The success of our League is due to its members - from the keen competitor to the conscientious official. However, without the countless hours volunteered by the latter in the shape of Secretaries, Organisers, Executive members and other positions, there would be no League. It is this tireless voluntary work which underlies the League's continuation over fifty years, and to which this booklet is a tribute. I might add that it is a mark of the members’ tolerance, ﬂexibility and sportsmanship over fifty years that the handbook of rules is still“ small enough to slip into one’s inside pocket. To all those, past and present, who have so freely given of their time, we are greatly indebted. Unquestionably, thanks must be expressed to Frank Hadfield, one of our excellent past Secretaries, for all his meticulous research and the lead he has given in compiling this booklet. The Executive Committee have found it necessary to condense masses of information, and during our meetings Frank has displayed immeasurable patience as his co-contributors frequently digressed into prolonged periods of infectious nostalgia! Inevitably, something of importance will have been missed and we hope no offence will arise. I hope you will all find time to enjoy this brief but important record of one of the finest Leagues in the country, and to our younger members, may it be an inspiration to continue with a full, rewarding and enjoyable commitment to Badminton. I was unable to attend the 1996 A.G.M. and in my letter of apology to the League Secretary, I reminded her that the League would be celebrating its 50th Anniversary on the 4th. "August 1997. Later that year, the League Executive Committee invited me to compile a history of the League which would form the basis of a booklet to be issued to celebrate the Anniversary. I have very much enjoyed researching and writing this history and also listening to the reminiscences of various people.l must stress that my comments are not necessarily those of the League Executive Committee! The main trouble I had was deciphering some of the handwriting in the earlier minute books (my own included), For a number of years these have been typed, so the person who does the history for 1997 to 2047 should have an easier job. Finally,l hope all those who read this history will enjoy it, whether they go back personally to 1947 or have just joined a club in the League. A meeting to form the League was held on 4th August 1947 . A consensus of opinion suggests it is most likely that the meeting was held at St.Thomas's School, Marriott Street, Stockport. There is no record-of any minutes being taken at this meeting, which has not helped with my research. The meeting was attended by representatives from clubs who used to meet in friendly matches. We do know that the following people were present: Jose Sutton (Edgeley), Philip Robinson (Bredbury St. Marks) and the late Cliff and Alice Ratcliffe (St. Thomas's). Another founder member who could have been at the meeting was Maurice Watson. Jose and Philip are now both Life Vice-Presidents. In 1992, when I was doing some research into the history of the League, I concluded that the following clubs were represented at the meeting . Bredbury St. Marks, Christ Church, Edgeley, Hatherlow, Marple, Romiley Methodists and St. Thomas's. However, during recent talks with Jose and Philip, they are both unable to confirm that Christ Church and Romiley Methodists were actually represented. It is sad to relate that none of these seven clubs are members of the League today. In the January 1985 edition of the League News Sheet, there was an article written by 'A.Muggins'. It is worth reprinting some of this article in order to stress the amount of work done by the League's officials and their commitment to ensuring that the League is run smoothly. Following then are extracts from the article which was called - "This is Official". Did you know that since the League was formed in1947 (37 years ago) there have only been four Presidents/Chairman, nine Secretaries, nine Treasurers, thirteen Match Secretaries and ten Results Secretaries, this is not a new version of the Christmas Carol. Records show that the first Tournament Secretary was appointed in 1957 and since then there have been eight. Other officials have been ten Publicity Secretaries since 1961, five C.C.B.A. Representatives since 1959 and six Coaching Organisers since 1970. In other words, if each office had been held by a different person each year, in 37 years there could have been 268 people involved, whereas only 74 have actually been involved. It is interesting to note that some people have moved from one office to another, and others keep coming back for more. What makes people want to get involved in running the League, and why so few? Well, with so few attending the A.G.M.s and most of those belng club officials, they probably feel that they are doing enough already. The others for one reason or another avoid the Chairman's eye. Some, however, find themselves pressganged in or even volunteer! Why get involved? I'm quite certain that it is not for the feeling of power, there is nothing to suggest that this is the case, It is more likely to be that they have a love of the game over and above playing it or, in some cases have become administrators when their playing days are over, Some of us really love the work, and I would miss the incoming phone calls during mealtimes, late at night and before breakfast. Oh how I would miss them! Every season the handbook contains the names of those people who have won something. Perhaps the time is ripe for including the full list of officials from 1947 to the present season in the handbook as well, because, lets face it, the officials invariably do more for you than ]oe Bloggs who won the Men's Singles in 19 something will ever do. I know that we don't always do as you think that we should, but we do try to do our best for the League as a whole. A lot of Mr. Muggins comments are still pertinent today. Pride of place goes to Cliff Ratcliffe, who held the joint role of President / Chairman for 30 years and before that was Treasurer for 4 years. Next David Thornley with 33 years service. At various times he was Secretary, Results Secretary, Publicity Secretary, C.C.B.A. Representative, Match Secretary and President. During six seasons he held two offices at the same time. Frank Hadfield was Secretary for 15 years plus 2 years each as Chairman and President. Philip Hartley has been Chairman for the last 3 years and before that 7 years as Results Secretary and 6 years as Treasurer. Freda Freeman — C.C.B.A. Representative for 9 years, Secretary for 5 years. Sue Orwin - Tournament Secretary since 1986. Judith Hartley - Results Secretary since 1988. Eric Lavin - Results Secretary for 9 years. Stan Messer — Results Secretary for 7 years and C.C.B.A. Representative for 5 yrs. Harold Ienkinson, better known as Jenks - Tournament Secretary for 8 years. Philip Robinson - Secretary for 8 years. Richard Paine - Tournament Secretary for 8 years. Barbara Ollier — Treasurer for 8 years. Cliff Johnson - Match Secretary for 7 years. Other people who have been great servants to the League, although not strictly officials, have been Brian Maltby and Mike Prior. The former was Junior Inter League Match Secretary for 14 years. He organised and took teams of various age groups to places as far apart as Leicester, Queensferry, Buxton, Keighley, Halifax and Stoke, as well as locally. The latter was Dance Organiser for 22 years. For 3 of these years there were other members on the Dance Committee, but for 19 years he was a one man Committee. . The League owes a great deal of gratitude to all the above people. The divisional system of the League is, I suppose, its backbone. There are, of course, other competitions but winning a division would, I suggest, mean more than anything else to a club and its team members. To start with, all matches were played by mixed doubles only. I have been told that Hatherlow was an all men club so they had to open their membership to ladies in order to take part. Season 1949/50 saw the introduction of ladies’ and mens' doubles into the match format of play that we know now. In season 1947/48 there was just one division, two the following season and three in season 1950/51. The number of divisions remained at three until season 1964/65, when a fourth division was added. Then over the next ten seasons the League expanded to eleven divisions. Some of the lower divisions were only required for a very short time. Now, all these changes seem very complicated, but at the time they seemed a good idea. Who knows, we might be back with a division eleven again in the future. In season 1982/83, a new rule was introduced to limit the size of the League to 150 teams in 15 divisions. this was when there were 50 clubs and 137 teams. However, the need to implement this rule never arose and is no longer part of rule 3. In the history of the League there have been two clubs who have dominated the premier / first division, these being Littlemoor and Macclesfield. The former won the title in 1959, between 1961 and 1968 and in 1977. A total of ten titles. Sadly the club was disbanded and left the League in 1988. The latter won the title between 1980 and 1983, 1985, 1986, between 1988 and 1992 and between 1994 and 1997, a total so far of fifteen titles. I don't propose to mention any other clubs who have won a division. If you look in the handbook at the long lists of winners, you will understand why. Of the 126 past and present clubs, 70 have won at least one division. In 1992 it was decided that a Veterans League should be established. For those taking part there are two main requirements, firstly they must have attained their 45th birthday and, secondly they must play in division 3 or below. The match format is different from that of the rest of the League, in that teams consist of two ladies and two gentlemen, and only 12 games are played, viz., two ladies’ doubles, two mens’ doubles and eight mixed doubles. The Veterans League started with two divisions but this was only for the first season. Since then there has only been one division. I understand that those taking part greatly enjoy their matches, perhaps because all the players are of a similar age group. There have been junior divisions within the League for a number of years. Records show that there were U14 and U16 divisions between 1974 and 1991, except for 1983/4 when there was no U16 division. During these years Glossop dominated the U14 division, winning the title seven times, six of them in succession. In the U16 division Grove Park won the title four times. Before 1974 there do not appear to be any records regarding junior divisions. Since 1991, apart from a two year break, there have been U12, U14 and U16 divisions. The first tournament was held in 1950 when Robert Fidler (Edgeley) was given permission to organise a mixed doubles tournament. Seventy two couples competed. In 1951 ladies’ and men's doubles were included in the tournament and then in 1953 ladies’ and mens’ singles were also included. For these events players were given a handicap. For the next sixteen years the tournaments comprised of the aforementioned events. Following is a list of new events that have been incorporated into the tournaments. The League has always been very fortunate in having clubs and individuals who have generously donated trophies for all the tournament events. The first trophy, given by Wing Commander Norman Hulbert, for the mixed doubles event, has an interesting story behind it. In 1949 the two M.P’s for Stockport were Sir Arnold Grindley and Wing Commander Norman Hulbert. Both these gentlemen were at the Dance that year, held at the Davenport Cinema Cafe. The former, having already donated a trophy to the League for what was then Division 1, insisted that the latter should also donate a trophy, which of course he did. With the Mayor of Stockport and many of his constituents present he couldn't very well refuse. I have been told that this particular Dance became something of a political meeting. To start with, the tournaments were held in various club halls, as follows:- A.S.M., Banks Lane School (where Littlemoor and St. Thomas's played), Compstall, Disley, Grove Park, New Mills, Poynton Social Centre and St. Augustines, The Armoury in Stockport and Dialstone Lane Centre were other venues. Eventually the Bramhall and Priestnall Sports Centres became available. Generally the former was used for all rounds except the finals. These were held at the latter. For the finals, seating had to be brought from Peel Moat School. It was collected in the morning, assembled, then taken down and returned to the School that evening. Iust another job for some members of the Executive Committee, occasional volunteers, and Philip Moss who provided the transport. When this was done it always seemed to be a wet Sunday. Apart from the number of entries for the first tournament I have not been able to ascertain the number of entries each year until 1968, when there were 277 entries. Ten years later, the number of entries had risen to 725, and for the next few years this figure was about average. Jenks has told me that one year there was a record entry of over 800! Over the last twenty years there has been a good attendance of spectators at the finals. In 1981 there were 200 present! In the last few years entries have been dropping and this year there were only 154 entries. Perhaps taking the tournaments to the Mulberry Sports Centre near Alderley Edge has some bearing on this low figure. All the above notes refer to senior tournaments. Over the years, there have, of course, been junior tournaments. Unfortunately records of these do not appear to be available. Generally, the junior tournaments have consisted of singles, doubles and mixed doubles at various age groups. 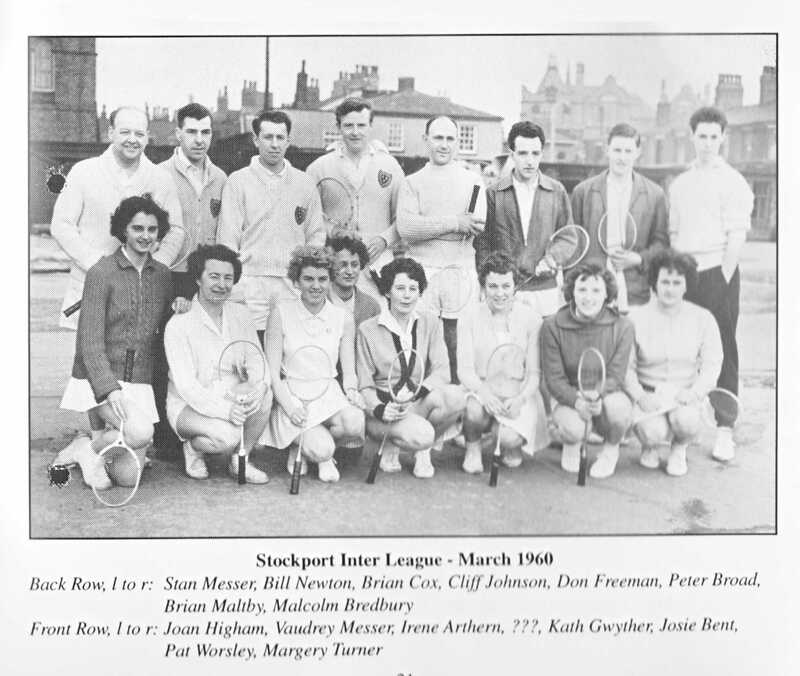 In 1974 the Stockport Sports Council sponsored a tournament for under 16 year olds, comprising girls’ doubles, boys’ doubles and mixed doubles. The League organised this tournament but it was open to all school children in the Stockport area. Latterly other age groups were incorporated. It was a very popular tournament but sadly the sponsorship was terminated a few years ago. Hazel Grove and Poynton Sports Centres were used for this tournament. The idea of this type of competition was the brainchild of David Thornley and the trophy for this was presented to the League by Stan and Vaudrey Messer when they moved from Stockport to go and live in Scotland. They were both prominent members of the League. Stan was on the Executive Committee for eleven years, acting at various times as Results Secretary, Match Secretary and C.C.B.A Representative. Vaudrey was Publicity Secretary for three years. Between them, they won many handicap tournament titles. They were both members of Werneth and Littlemoor. All teams in the League are entered in the competition, which is based on the knock-out principle. Each team has a handicap depending on which division they are in. Teams comprise three Ladies and three Men and matches consist of seven events:- Men's and Ladies’ Singles, Men's and Ladies’ Doubles and three Mixed Doubles. The trophy was first played for in 1969 and for the first four years was won by Glossop. Since then thirteen other clubs have won the trophy, notably Macclesfield with five wins. In 1994 it was decided to run the competition with A and B sections, the winners of each section playing for the trophy. The A section is for teams in the top four divisions and the B section for all other divisions. To start with, clubs mainly played in church halls, schools, factory canteens and small sports halls like Brookdale and the original hall at Mellor. Those people who have played their badminton mainly in the modern sports centres, with their clinical atmospheres, will not be able to appreciate the fun it was to play in some halls. They are probably too young to remember anyway. Some halls even had the baseline above floor level! Bethesda and Disley both with gas lighting at one time. Mention of Disley reminds me of the times arriving there on cold winter nights with a foot or so of snow on the ground, to be given hot soup before the match started! When I was playing in the 1960's and 1970's, most clubs tried to outdo other clubs with bigger and better suppers, so that one tended to remember a match for the supper provided and the general hospitality rather than the score. I think things did get a little out of control regarding refreshments because I remember the Executive Committee discussing the matter and issuing some guidelines. Probably the club with the most interesting hall was the one which played at Stockport Swimming baths, actually in one ol the pools, it was empty (honestly). I have been told that one went down steps onto the court! The name of the club and the date they were members are not known. Not surprisingly they were only members for a season. At present there are 35 clubs who are members of the League and between them they enter 83 teams. The following table shows how the membership has fluctuated over the fifty years at five year intervals. The maximum number of clubs and teams the League has had are 56 in 1979 and 139 in 1981. In 1990, the League agreed to allow small clubs, provided that they were properly constituted, who played in Stockport sports centres to take out associate membership. These clubs do not participate in League play, or have voting rights, neither can their members enter senior tournaments. At present there are 22 associate member clubs. Following is a list of all the clubs who have been members, or who are members of the League. Clubs highlighted in bold are present members. Disley Amalgamated Offerton Vymura S.]. The first Dance held for the presentation of trophies took place in 1948 (venue not known). In 1949 the Dance was held in the Davenport Cinema cafe, tickets cost 4 / 6d (22.5 new pence). Since then, the following venues have been used:- "Stockport Co-op cafe, Belgrade Hotel, Mirrlees Social Club, Heaton Moor Conservative Club, Quaffers, Brookdale Social Club and, for 1997, a new venue, Ladybridge Sports Club. These events have always been well attended, the main event of the evening, being the presentation of divisional and tournament trophies. As the League has grown and the number of tournament events increased the presentation has taken longer nearly every year. At one time the Executive Committee tried to obtain a prominent person in Badminton, or from other sporting circles to present the trophies but this was never easy to arrange. For about the last ten years the President of the League has carried out this duty. For three years in the 1970's Phillip Pearson, who was then Publicity secretary, wrote some very interesting articles that did appear in the local papers. In the early 1990's, another Publicity Secretary, Brian Mantel, managed to get his articles printed in the Stockport Messenger. However, without a doubt, the best publicity the League ever got was when David Thornley produced his wonderful News Sheets. These appeared in the mid 1980's and were circulated to every club. Their contents were full of interesting news about League and club affairs and also news about past and present members of the League. Some of David's views generated much correspondence from some club secretaries. It wasn't just that the contents were fascinating, it was the way they were written. David had a unique way with words. Unfortunately there doesn't seem to be a complete set of these News Sheets in existence, A great pity, for they would tell a good story about part of the history of the League. It was not until season 1949/50 that the League affiliated to what was then the Lancashire and Cheshire Counties Badminton Association. A few years later this Association was dissolved and each County formed its own B.A.. The League elected to join the C.C.B.A. In season 1950/51 the League also affiliated to the Badminton Association of England. For many years the League has only one member on the C.C.B.A. Council, but by 1980 it had nine members on the Council. Therefore, it was able to play a stronger role in the affairs of the C.C.B.A. Over the years the League has had many members who have played for the County at many levels, and some have played at international level (see lists)- On three occasions Stockport players have been awarded the C.C.B.A. 'Player' of the Year‘ Award, the recipients being Sue Orwin, Alastair Mclntosh and Davld Mitchell. In 1977 David and Kathleen Thornley presented the Thornley Trophy to the C.C.B.A This trophy is competed for by junior teams, one from each League affiliated to the C.C.B.A. The Thornley Trophy competition is very similar to the Baxter Trophy which was inaugurated prior to 1977 and is for senior league teams. 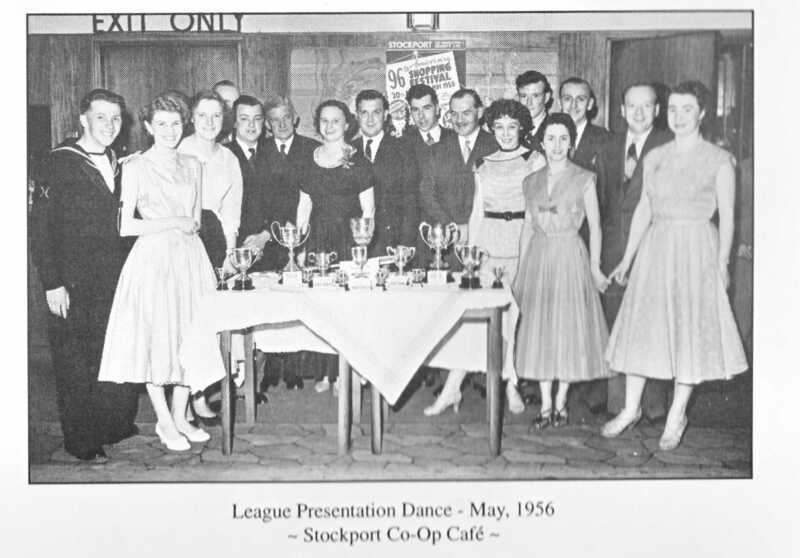 tn the past the .Stockport League has won the Baxter Trophy fifteen times and the Thornley Trophy ten times. We held the Baxter Trophy continuously between 1978 - 1990, other years we won the Trophy were 1964 and 1973. We held the Thornley Trophy continuously between 1978 - 1981 and 1983 - 1988. Vice-Presidents of the C.C.B.A. include the following who have been associated with the League - John Berry, Jenks, Peter Richardson and Barbara Wadsworth. Until a short time ago, David Thornley was also a Vice-President. In 1990 the B.A. of E. proposed a new affiliation package that would increase fees from £1.60 to £5.00 per player. At the A.G.M. of the B.A. of E. in the same year, the increase was approved, although the C.C.B.A. representative voted against it. Generally, most clubs were already dissatisfied with the need to affiliate to the two associations, and this vast increase in fees was the last straw. An E.G.M. of the League was held on October 18th 1990 at which the matter of affiliation was discussed. The meeting decided that we would resign from the B. A. of E. and the C.C.B.A. Since this meeting nearly seven years ago, the League has not felt the need to reverse the decision taken at the E.G.M. ’Sue has also played for Gloucestershire, and Avon and Somerset! When the League started there was no committee to look after the day to day affairs of the League. These were taken care of by an unofficial committee consisting of José Sutton, Cliff Ratcliffe and Philip Robinson. The handbook for season 1957/58, the earliest one in existence that I know of, had 24 pages. For comparison, the present handbook has 80 pages! There are currently 22 rules. Over the years these have, from time to time, been added to, deleted or amended as circumstances have demanded. Probably the rule that has been changed the most is the one regarding which shuttle should be used! Sifting through the minute books, I have extracted some of the more interesting or unusual, or even bizarre, happenings that have occurred. 1948 The first League rules were drawn up and it was decided to print the rules and fixtures in a handbook. The secretary alone organised all the fixtures. Committee formed consisting of one member from each club. 1949 October. The first dispute was dealt with. 1950 The accounts showed a loss of £1-4-6, (122.5 new pence). 1951 An Executive Committee to be formed. Inter League matches played against the Oldham and Manchester Leagues. Approval given at the A.G.M. for clubs to try plastic shuttles. 1954 Far too many complaints received by the Executive Committee regarding late starts and late finishes of matches. Clubs informed that they must have one couple to be ready to play at 7pm. 1956 Approval given at the A.G.M. to the use of plastic shuttles and that R.S.L. feathers could be used, if both teams agreed. 1957 Badges awarded to players who have played in at least three matches for the League 1st team. (This practice was stopped some years ago). 1958 The annual subscription per team increased to 10 shillings (50 new pence). 1960 Trouble with plastic shuttles. Clubs told to return them to the supplier or warm them up before use. 1968 Philip Hartley received the Most Promising Junior award. 1968/69 Fourteen Inter League matches played, we won 9, lost 4 and 1 drawn. 1969 The first Coaching Organiser appointed. 1972 It was suggested that adverts be put in the handbook. The twenty-fifth Anniversary Dance held. A special cake was baked for the occasion. Between February 13th - 28th no matches played due to power cuts. 1973 There was another power cut crisis that affected matches. 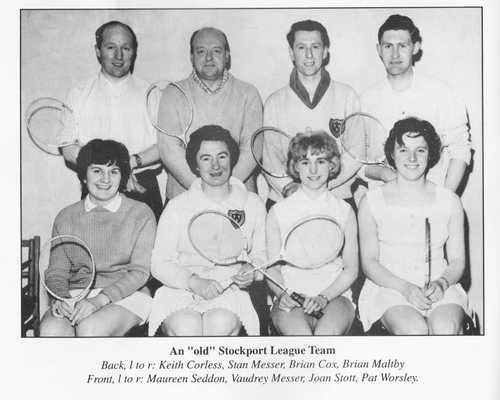 1974 Offer accepted from Stockport Sports Council of trophies for junior tournaments. 1976/77 There were no disputed matches. The Executive Committee ruled that future tournament rules must include the following: players must wear white on court, except for knocking up. 1981 February 17th / 18th. Probably the longest Executive Committee ever, started 7.30pm, finished 12.17am! (This record now broken - see later). Jim Hall Sports sponsored the tournaments. I981/82 Stockport players in Cheshire 1st, 2nd and 3rd teams. 85 late score sheets received and it is only November! 1982 236 late score sheets received but it is February. Sub committee set up to consider the rules. Qualified umpires to be used for tournament finals. 1983 A.G.M. approved rule changes and re-numbering of same. 1984 St. Thomas's celebrated their 50th Anniversary on October 6th. Macclesfield celebrated their 60th Anniversary on December 17th. 1985 - 91 The average attendance at A.G.M’s only 74. 1992 For safety reasons, the maximum number allowed to attend the A.G.M. was 200. The hall at Queensgate was full. The reason — shuttles of course. 1993 We won the Inter League competition again. Same leagues taking part as in 1991. We won the Crewe Inter League Tournament. Other leagues taking partwere North Staffordshire and Crewe, who each entered two teams. Otherleagues refused to play in this tournament when they knew that we hadaccepted an invitation to take part! 1994 The Executive committee discussed standard of dress on court. It wasunacceptable for players to play in track suits, leggings of various colours,cycling shorts, dark shirts, shirts with offensive slogans and beach type wear. 1996 Reported that the Veterans League was getting too serious. 1997 March E.C. meeting started on a Wednesday at 8 pm, lasted until 12.30 am,then continued the following Monday from 8.30pm until 11 .30pm. The onlymatter on the agenda - disputes! History in a way is looking back at times past in a sort of nostalgic fashion. So let us have a good wallow in nostalgia with excerpts from an article in a Newsletter ( a later form of the News Sheets), from the pen of, who else, but David Thornley, entitled “Ah, Yes, I remember it well". The time when you could work out the league fixtures on the back of a postcard, when no—one, but no-one, had more than one team in a division - when, come to think of it, there was only one division. The time when you could play in a match and could be utterly and completely sure that you were not going to be beaten out sight in the mixed by a couple of brilliant twelve year olds (complete with exotic gear and a name on the back of the tracksuit). The time when last bus times assumed a fair amount of importance,the time when Cliff Ratcliffe wore long white flannels. The time when I dreamed that perhaps for just one season I would not be third man on Hatherlow's lowest team. Maybe the above will act as a catalyst in the memories of reader in order for them to recall events in years gone by. My own favourite recollection is of everyone playing in white! When one considers that the game of Badminton has been played since the mid 1860's, I see no reason why this League should not prosper well into the future. Since 1947 clubs have come and gone but the League has remained a focal point for Badminton in Stockport. At present there is a thriving commitment to encourage juniors to play in this area. These juniors are one of the cornerstones which will support the League in the future; the other is the constant need for the continuation of members to be committed to doing the work at club and League level. With these in place, and I feel sure they always will be I can see no reason why our game under the auspices of the League, should not flourish.